Announcing One Of The Most GORGEOUS & Well Cared For Single Story Homes! 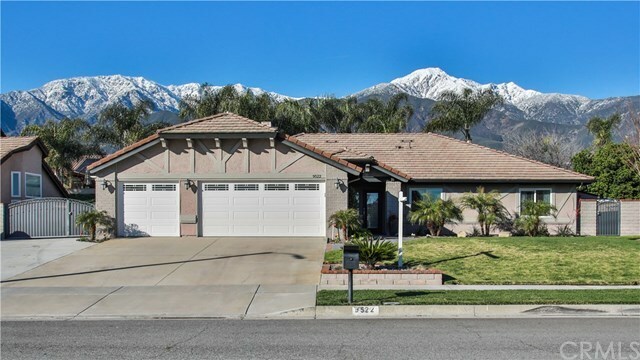 Located In A Highly Desired Neighborhood North Of The 210 Freeway. This Home Is Immaculate And Features One Of The Best Floor Plans The Area Has To Offer. There's A Large Foyer That Looks Into The Formal Living Room. Around The Corner Is The Great Room That Is Very Spacious With A Cozy Fireplace For Cold Winter Nights. A Beautifully Designed Kitchen With An Abundance Of Cupboard Space And Pull Outs For Easy Access + Granite Counters And A Huge Picture Window. You'll Love The Tasteful Wood Floors, Newer Windows With âHide A Screenâ And Stunningly Designed Bathrooms. The Master Bath Has A Huge Step In Shower, Heated Towel Bar And Separate Soaking Tub + A Large Walk-In Closet. The Awesome Covered Patio Makes A Wonderful Extension To The Home And Is Perfect For Entertaining On Those Special Occasions. The Roof Was Just Tuned-Up With All New Underlayment. The Way The Home Sits On The Beautifully Landscaped 13,680 Square Foot Lot Helps Protect It From Wind And Gives It A Very Private Feeling. It's A Rarity To Find The RV Parking This Home Has To Offer With Over 70' Of Space; Large Enough For A Boat & RV! The 3 Car Garage Is A Storage Dream Come True With Lots Of Cabinetry And A Ton Of Storage Space. To Many Custom Feature To Mention! If You Are Tired Of Your Two Story Home, Now Is The Time To Make The Switch. Homes Like This Do Not Come On The Market Often...Act Quickly Or This Spectacular Home Will Be Gone!